Race 9: Last Wet Season Race. 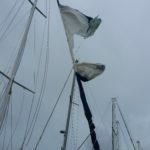 Our headsail had been damaged during Tropical Cyclone Marcus. 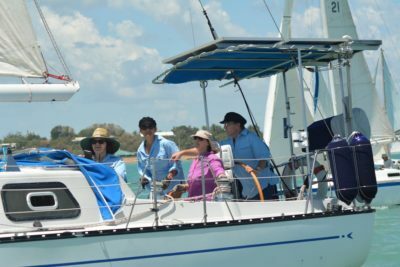 As a result, we decided to use our storm jib as we were determined to finish the wet season race series. It’s always heart warming to know that when in need, those around you will step up and lend a helping hand. 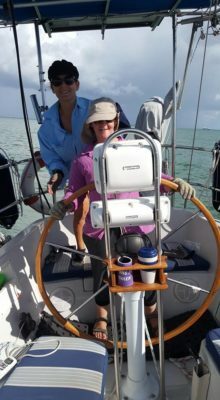 So it was with fellow sailors. I received a call on Friday afternoon to say that a spare head sail was available for us to use on Sunday’s race. Beauty!! Down we trot to the marina on Saturday to fit the sail and get race ready. 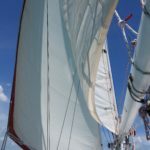 We were very grateful and excited to have the loan headsail. Well, overjoyed actually. The winds were 15 plus knots, waves about 1 metre. The start out from the Sailing Club in Fannie Bay was rather hectic. There would have been at least 30 boats, so it was very chaotic indeed. The weather was perfect. A great day to be out on the water. We raced well as a team and most importantly, had fun.